Oсобенностью чипсетa SiS 771 является встроенное 128 битное графическое ядро SiS Mirage3, которое имеет поддержку DX9 Shader Model 2.0, с аппаратным ускорением 2D и встроенной поддержкой воспроизведения MPEG2. Графическое ядро оптимизировано для воспроизведения High Definition Video.Чипсет поддерживает шину PCI Express, и позволяет использовать внешние видеокарты - на графический слот выделяется 16 линий. Южный мост поддерживает только стандарт SerialATA(на инженерном сампле установлено 4 канала SerialATA I ), 2 канала ParallelATA, 8 портов USB2.0, Fast Ethernet. SiS671FX - северный мост для Intel Core 2 Duo, Pentium D, Pentium 4, Celeron D с интегрированным графическим ядром Mirage 3. Данный чипсет поддерживает процессоры с FSB до 1067 МГц, до 4 Гб памяти DDR2-667. Производители материнских плат, использующие SiS671FX, будут имеют возможность разместить на плате один интерфейс PCIe x16 для установки внешней видеокарты. Mirage 3 поддерживает API DirectX 9 и OpenGL 1.5, однако редакция пиксельных шейдеров, реализованная в продукте, имеет версию 2.0, а не 3.0. Поддерживается воспроизведение видео в формате MPEG2 с прогрессивной разверткой, аппаратное сглаживание изображения, различные алгоритмы масштабирования и т.п. Рабочая частота интегрированного графического ядра составляет 250 МГц. SiS 770 будет поддерживать только 1 слот PCIe х16, но будет иметь встроенное графическое Mirage 3, которое будет поддерживать видео высокого разрешения (до 1080p). Средствами южного моста SiS 966 в готовых материнских платах будут реализованы до 4 портов SATA, до двух разъёмов PCIe х1, до шести PCI, до 8 портов USB 2.0, звуковой кодек HD Audio, 2 сетевых адаптера. Silicon Integrated Systems today announced the release of three new chipset products for notebook computers powered by AMD (NYSE: AMD). The SiSM760, SiSM761GX and SiSM770 chipsets support the latest AMD Turion™ 64 mobile technology and are fully compatible with the latest power-saving technology for improved reliability and performance for notebook computers. Additionally, the SiS chipsets also support the advanced PCI Express specification, bringing the advantages of PCIe into the realm of mobile computing. When combined with SiS wireless LAN chips, SiS fully satisfies the mobile computing needs of today and tomorrow for AMD Turion 64 mobile technology. The new AMD Turion 64 mobile technology is based on the AMD64 architecture, bringing advanced 32- and 64-bit technology to the high-end market for thinner and lighter notebooks. This technology enables longer battery operation, while the SiS chipsets contribute to the "thin and light" design of the AMD Turion 64 mobile technology-based notebooks. All three new SiS chipsets support AMD's advanced 1600MT/s HyperTransport™ technology for improved system performance and low-latency, high-efficiency data transfer. The SiSM761GX chipset also features SiS's exclusive HyperStreaming™ technology, which provides intelligent data flow management for maximum performance in parallel resource allocation and concurrent / batch processing of data flow packets. 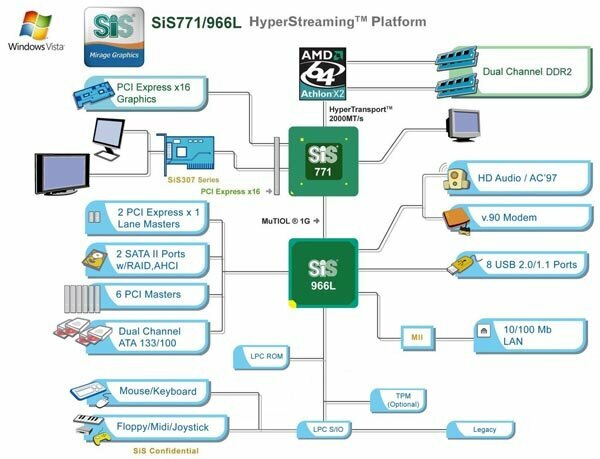 HyperStreaming™ technology delivers revolutionary performance for high-end mobile computing platforms. The SiSM760 chipset has now entered mass production, marking one of the first AMD Turion™ 64 mobile technology-based chipset products to enter the market. "SiS has aggressively developed a series of excellent chipset products, providing customers another choice for AMD64 mobility," said Chris Cloran, director, mobile marketing, Microprocessor Business Unit, CPG, AMD. "AMD Turion 64 mobile technology is designed to be the most advanced family of simultaneous 32- and 64-bit Windows®-compatible processors available for thin and light notebook PCs." "The SiSM760, SiSM761GX and SiSM770 chipsets for AMD Turion 64 mobile technology are the most ground-breaking products developed by SiS to date," said Daniel Chen, the CEO and President of SiS, "With our wealth of R&D experience and exclusive technologies, SiS is leading the market by providing a most efficient, most reliable and most consumer-minded group of products for AMD Turion 64 mobile technology." By adopting SiS' revolutionary Mirage™ graphics core, the chipsets provides among the best graphics performance for all the users of the AMD64 platform. The SiSM761GX and SiSM770 also support the new PCI Express X16 interface, which provides an 8GB/s bi-direction transfer rate, compared with the current AGP 8X standard of 2.1GB/s. Combined with SiS' latest South Bridge Chipset SiS966 / SiS966L, SiS offers buyers a formidable combination that is ready for the next generation of peripheral devices thanks to PCI-E support. 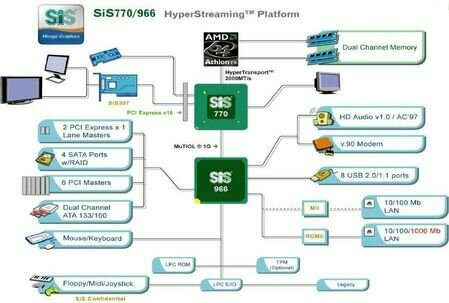 The SiS966 / SiS966L support 2 PCI-E x1, Gigabit Ethernet, 8 USB 2.0 ports, High definition 7.1 channel sound, 4 SATA and 4 PATA. The SiS966 / SiS966L also support Multiple RAID disk array modes in RAID0, 1, 0+1 and JBOD.